Discussion in 'Bite Reports' started by Phalagorn, Sep 30, 2006. But before i tell more about the time event and symtom after the bite, I would like to tell you about my unlucky middlefinger. Just a couple of weeks before i got bitten, it occurred two accidents when i was at work. First i slipped with a dental drill and drilled myself next to the nail. The next week I slipped with a surgeon scissor and stuck it into my fingertip and now I've got bit by a spider in the same <edit> finger! 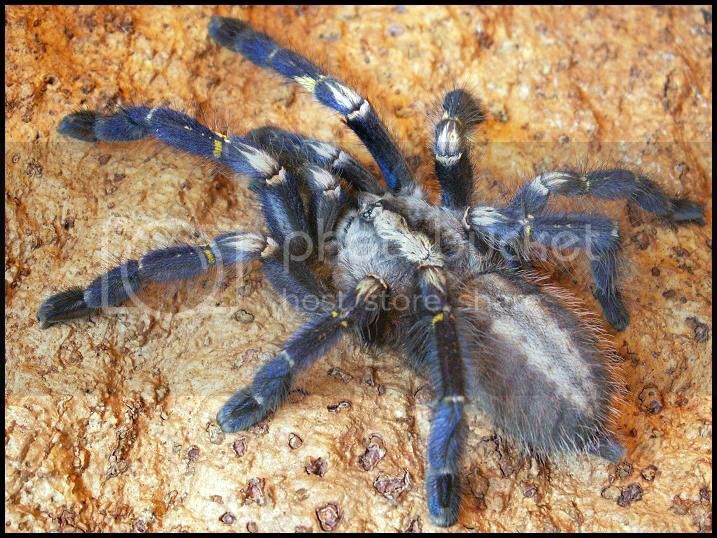 It all started when I was gonna take some photo/movie shots of one of my Poecilotheria metallica. I opened the can and tried to get it out but it just kept running around like crazy in the can. 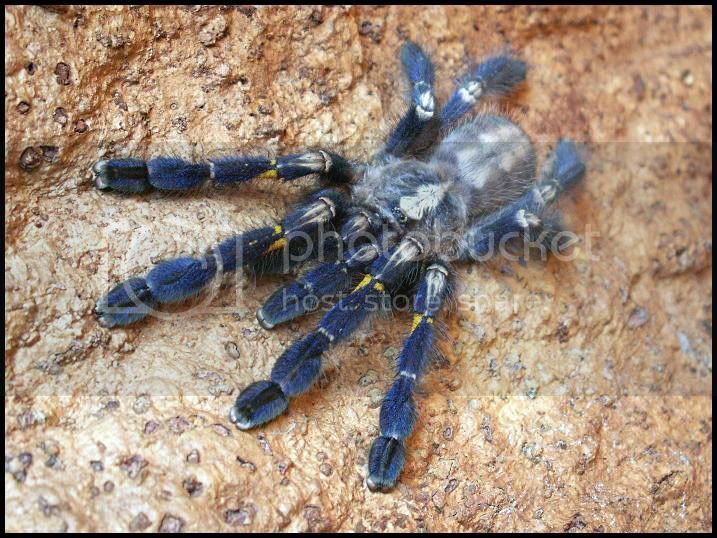 (P. metallica is a very nervous and lightsensitive species that rather run than pick a fight). In opposite to Poecilotheria this species is among the least defensive. They rarely take defensive posture, in fact I've only seen this once from my subadult male. At last I managed to get it on a piece of cork and was just about to lift it out of the can, thats when it happened. Suddenly I felt a sting and I could really feel its tooth penetrating my finger. I stayed cool and went to get pen and paper to write this report. Size: 4,5 cm in BL 12 cm i LS. (Distal interphalangeala joint) I started to feel the adrenaline come, high heart rhythm and i started to sweat. No new symtoms. Does not sting and pound as much as before, more sore. Still have high heart rhythm. My heart starts to get down to normal speed now. I start to get headache. Sweat alot from my left hand. Starts to sting alot in my finger again. I feel kind of rigid in my hand, feels a litle stubborn when i open/close my hand. It feels like when you have training aches in left hand and underarm. It does not sting as much as before. My headache starts to decrease. I feel a little rigid in the jaw, cheek muscles and eyes. 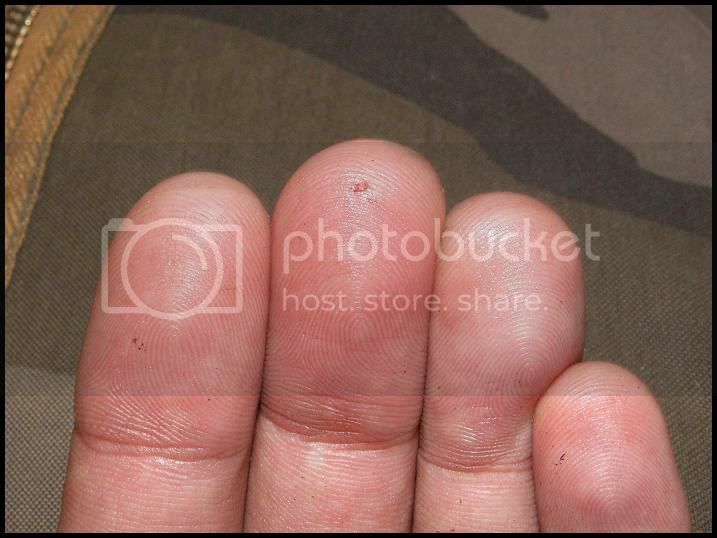 Does not feel as much as before but i am a litlebit sore in my finger, that has swelled about 10-20%. I feel tierd and drowsy. Have slept good tonight. Local pain and still sored in my finger, feel feverish and sweats enormous. Woke up 4.00Am having difficult to breath. Felt verry feverish and sweat enormous. Still alitle sore in my finger. I had trouble to fall asleep so I decieded to go to work after all. The fever and sweating continued until noon when i took two painkillers. Has been alittle rigid in my wrist and a bit up too the arm, else than that no new symtoms. I feel completely recoverd apart from that my whole left longfinger cramped and locked it self for a while today. No other symtoms. Well! Now it has happend. 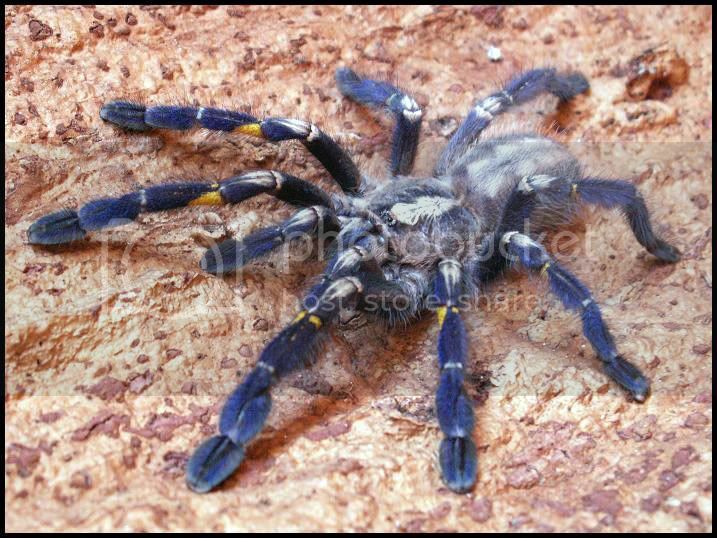 Now i have lost my spiderbitevirginity and it was an Poecilotheria metallica. It's alittlebit pity to get bitten after 6 years in the spiderhobbie. I may not have had the tweezer close by all the time and sometimes you dont think before you act. An good advice to all: Always use a tweezer or something like it, you never know wen an accsident occur! I feel a little honored that the bite was from a Poecilotheria metallica. As far as i know there is no other bite reports from this species yet? I see this as an experience, now i have been bitten and know how it feels. P. metallica on the pirctures is the one who bite me. Speciall thanks to Björn Nilsson who helped me to translate my article to english. Lees Summit (K.C. ), Missouri. U.S.A. I went to put my 7 inch female in a pinch hold (which I have done before with no problems) to examine her abdomen when my left thumb started to slip from her starting to struggle. Both fangs got penitration into my thumb pad. As I pinched my thumb to minimize the flow of venom up my hand, I turned on the hot water in my bathroom. I instantly felt a hot, burning, pulsation in my thumb. Bearable but maid me say a few words I can't repeat. As the water was heating up, I went downstairs to get a zip tie. I put the zip tie around my thumb, close to the first knuckle and tightened it up to free up my right hand. I went back into the room and corraled my metallica into her home without further problems. Still feeling the sharp burning of the bite, I went back into the bathroom and started swearing some more because of the extremely hot water I was fighting to hold my thumb in. I managed to hold it in the water for 15 to 20 minutes. By 11:20, some of the sharp pain had subsided and given way to the dull throbbing that might come with a good burn from a hot stove. I then cut the zip tie off and put a band aid on tightly, jsut above the bite. I was asleep by 12 midnight with the only side affect being the throbbing at the bite location. Woke up at 4:00 a.m. on 11/7/08 to go to work with no bite side effects what so ever. Took the bandaid off and I was surprised that I had no joint ache, throbbing of any kind, not even a sore thumb. I could attribute this to very little venom being injected, or the measures taken by me following the bite. Not sure which but whatever happened, the whole thing ended up being no big deal. I do think venom was injected given the pain I had following the bite for the hour duration. As with the poster above, this was my first T bite from a species that is known to have pretty potent venom. I'm glad to say, it all went pretty smooth. I will still handle my T's and I still understand that it will happen again sooner or later. With that said, Everyone reacts different to venom so please be careful and don't handle your pets unless you have to. Foolishly got tagged whilst transferring my 1" sling 'Marge'. She shot up my left hand and sunk her fangs in just below my index finger knuckle. No adverse reactions noted 2-3 hours post bite. I suspect it was a dry bite. The only pain came from the mechanical trauma of the fangs breaking my skin.